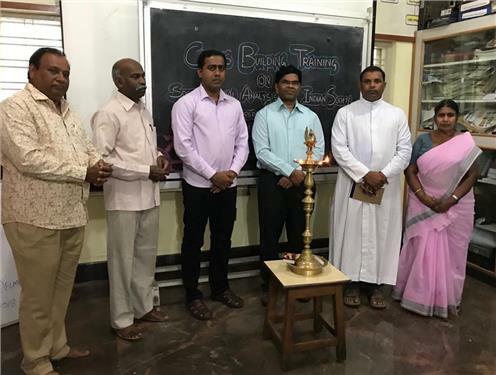 The Indian Social Institute (ISI) Bangalore in collaboration with the Karnataka Regional SC/ST commission organised a training program for the Dalit Christians in South Karnataka in Mysore diocesan social work centre. Around 30 young people and women participated in the training. Dr. Chand from ISI Bangalore the chief organiser of the program explained the need for capacity building of Dalit Christians and said it is a series of training in which the participants should attend without fail. Fr. Yagappa the Regional secretary and Mr. Kennedy the Regional Joint secretary for the Karnataka Regional SC/ST commission coordinated the program. Fr. Devasagayaraj, Secretary to the CBCI Office for SC/BC gave the inaugural talk. Dr. V. Shanmugam, professor at the Mysore University guided the people with values of the Constitution and the need for the social equity for the development of the Nation. Fr. S.D Joseph the first Dalit priest in Karnataka encouraged the participants with his presence. There will be 12 follow up training for the participants and the same will be replicated in North Karnataka Region.